Starting today for the month of Ramadan, Muslims around the world will fast from dawn to sunset, and then feast. 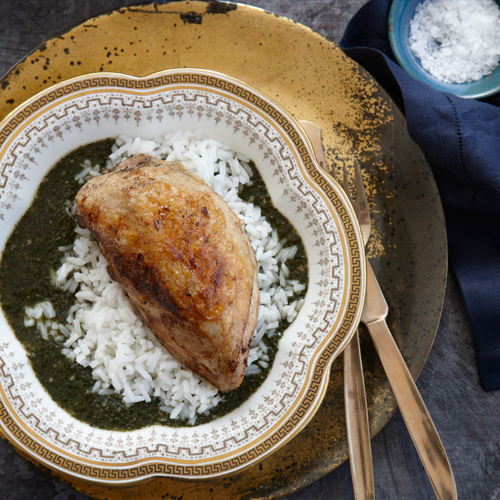 An accomplished cook and blogger, Mais Khourdaji combed the Food & Wine archives for the best recipes to make during the holy month. Here is what she had to say about some very delicious recipes. "Using vegetables in season is very much a part of Arabic cuisine, and Ramadan falls in the heart of the summer for the next few years. The bread crumb topping used here is nontraditional—usually, a dish like this would be topped with toasted nuts—but delicious." "Soup is ideal for Iftar, the meal that breaks the fast each night, because it is nourishing but not too filling. This one is a Ramadan staple." "Anything tangy is a great palate-primer during Ramadan. The fresh tomatoes and lemony dressing are also welcome after a day of drinking no water." "Stuffed grape leaves are indulgent, yet relatively easy to make in a large batch for a crowd. Many traditional recipes call for layering the leaves in the pan with whole garlic cloves and lamb shoulder for extra richness." "Many versions of this Ramadan favorite are found across the Middle East. Served in a bowl with rice, it’s rich, filling and very comforting." "This is one of those dishes you learn from your mother or grandmother, as the art of making kibbe can be tricky to learn. The warm yogurt sauce and the flavorful meat filling make each bite satisfying." "Called bambia in Arabic, this okra and tomato stew is enriched with veal shank. It’s best to make this dish in the summer, when it’s easier to find small okra, which are sweeter and more tender." "This green bean dish, called loobyeh, can be made with or without tomatoes, but plenty of garlic is always included. It’s very common on Ramadan tables because it’s easy, delicious and healthy." A first-generation Syrian American, Mais Khourdaji is a child psychologist and a passionate, accomplished home cook who has appeared on ABC’s The Chew.